Going forward amongst other pertinent information, the newsletter will be posted on this site along with your photos and articles, which can be shared with fellow Audi enthusiasts "On the Road" page. The new logo and website are a result of the recently initiated collaborative effort between the ACNA and AoA, which included the standardizing of branding and all chapter logos. For those of you who are into Twitter and Face Book we have also taken some steps in that direction, check it out when visiting the new site. On behalf of the BoD and ACFL Chapter, I would also like to express our appreciation to Pete Zajac and his son Jeff who after some hard and very creative work in 2009, provided us a new site from scratch when the audiclubfl.com was no longer viable. Some great plans are afoot to have a get together for the start of the 24 Hours of Le Mans. We are awaiting confirmation from the dealership, nevertheless, make sure you have kept your calender set for Saturday June 16. Stay tuned as additional information becomes available for this event to be held in the Gulf Coast Region. Give David a shout at david.loppert@earthlink.net for information regarding Hooked on Driving events for the month of May. May 5th, 7:00 AM Cars and Coffee. Join enthusiasts of Audi and other marks for a little cars and coffee at both Audi of Tampa (Reeves Motorsport facility) and Suncoast Audi in Sarasota. May 12th 8:00 AM Breakfast. Start Saturday off with some sustenance and Audi talk at the Cracker Barrel located at 4011 Ulmerton Road Clearwater, FL 33762 Please RSVP by noon May 11th tobob@audiclubfl.org. Hecha en Mexico http://www.fourtitude.com/news/publish/Features/article_7705.shtml, and I am not referring to where Herdez salsa sauce for chips is made, but an interesting and informative take on the new Audi facility to be built south of the boarder. The 12/1 edition of Audi Magazine in electronic format, http://viewer.zmags.com/publication/b1a19cae#/b1a19cae/1 Certainly a couple of evenings worth of enlightening articles. Now that Ducati is being added to the Audi brand tent, http://audiusanews.com/pressrelease/2856/93/audi-ag-acquires-sports..., would it not be fantastic if they brought out an additional line called the Four Ringed Heritage Series, which would consist of a DKW motorcycle with a side cars similar the Urals based on a 1939 BMW R71 (?) that are presently being built in Russia. http://www.imz-ural.com/. Now that could lead to one heck of a cool parade lap or corral with all those bikes and side cars at Sebring or where ever the Four Rings gather. And finally, it is time for the numbers, Audi's April sales report: http://audiusanews.com/pressrelease/2890/1/audi-sets-all-time-u.s-s... Audi increased sales by 15% April TY/LY and 15% YTD, BMW 12% April TY/LY and 15.7% YTD and Mercedes 23.8% April TY/LY and 17.5% YTD. To those of you, who recently joined the ACNA, welcome. 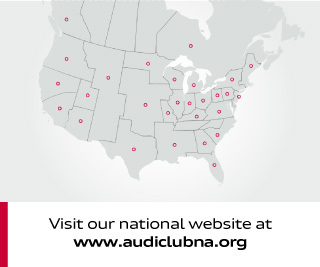 In addition to the camaraderie, there are numerous benefits from membership including the club loyalty program, which is worth $500 upon the purchase of a new, or CPO'ed Audi, see audiclubna.org for details. Within approximately 45 days of one's purchase of an Audi, the ACNA sends you a loyalty check for $500. If you presently do not belong to the ACNA, check it out at audiclubna.org and review not just what is going on for Audi enthusiasts but also some excellent articles in the magazine, quattro quarterly. Finally, this newsletter is being sent out on the Gmail account. 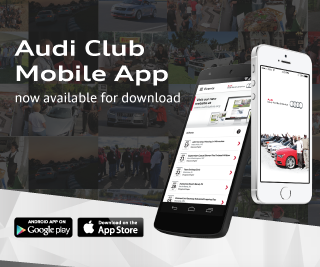 Please use the bob@audiclubfl.orgaddress for any correspondence, thanks. If you have any questions, please give a shout.